Welcome to the first Income Report for Obstacle.co. I’m very excited to start writing these because I do believe they can become insanely valuable if done properly. What do I mean by done properly? You can read about the philosophy behind Income Reports here. The problem with advertising and sponsored posts is that to really make money with them you need a ton of traffic. That isn’t going to happen the first month of your blog, plus they are crappy ways of making money because they don’t scale. To put this another way I will never use advertising or sponsored posts as a way to make money. They aren’t worth the time or effort. Affiliate marketing is nice as well, but similar to advertising you need enough traffic to make it worthwhile. There are affiliate links sprinkled throughout the site, but without the traffic, there hasn’t been any revenue generated from them yet. So if you can’t aim to make big bucks the first month, what do you do? You lay down a strong foundation and plan for the future. That is where things go a bit funny with Obstacle.co. There is a plan, but the plan for the first month was to act as if I was fresh with this blogging thing and approach it like that. So I did what a lot of people would do and look for popular posts that I could write and emulate them, post a lot on social media, and hope that traffic comes. Why would I do something foolish like this? Because Obstacle.co and Thrive/Strive are acting as case studies for you. I wanted the first month to be a typical first month for any blog and now the next 11 months I will start to implement my strategies. If things go according to plan then I have the material in place for a couple of awesome courses. If things don’t work out, then you get to read about it here and learn what not to do. So without further ado, let’s dive into the numbers. There is no point in saving this for last because I know what type of stuff you are looking for. You can’t fool me. Cash rules everything around you. C.R.E.A.Y? This one is pretty easy. The money I made this month (meaning actual money that hit my bank account) was $0. We don’t play around with fake money. Income is the money that I can spend right now if I wanted to, not the money that is supposed to hit next month. Expenses, on the other hand, are something different. I definitely spent some money and it is important that you keep track of your expenses when running a blog or any type of business. That is a healthy amount for the first month of blogging, but the majority of those expenses come from the two annual subscriptions of Tailwind. As you can see I use both Tailwind and BoardBooster and to get a better understanding on why, you should check out the post on Tailwind vs BoardBooster. Besides that, I have basic hosting costs, ConvertKit subscriptions, and a Google app subscription. Does this mean you should be paying this much for your blog when you get started? Absolutely not, but I will guarantee you that when you start to grow your blog and become serious about it, these are the expenses that you will end up paying. It can be too easy to get caught up in Superhero syndrome where you try to do all of the work on your own or try to save money by buying cheap services, but every dollar spent on these services goes into saving me time to work on other things. It’s an investment. Every business needs investment to grow. Yep, I’m in the red after the first 30 days. This shouldn’t be surprising at all due to the initial cost of investment for starting up these sites. I actually prefer to be in the red early because it acts as motivation to push forward and get myself quickly into the black. If all you are doing is spending $5 a month on hosting for your blog and that is the only expense you have, are you going to push yourself? Motivation can work in strange ways. Traffic is a dangerous metric to track because it can consume you. It’s way too easy to stare at your metrics every hour to see if the needle is moving. I’ll admit that I did this myself when we launched the sites, but after the first week I probably only looked at analytics two or three more times. Because it takes time to build up relevant and consistent traffic. What I mean by this is that you can do a lot of tricks and gimmicks to get a splurge of traffic for one day, but what you often find is that the traffic is gone the next day and never returns. Much of that traffic doesn’t even care about what is on your site and that can be evidenced through the bounce rate. The goal for the two sites was to see what happens when someone does come to the site. Do they stick around? Do they leave immediately? So what can we see in these pretty numbers? Nothing major. 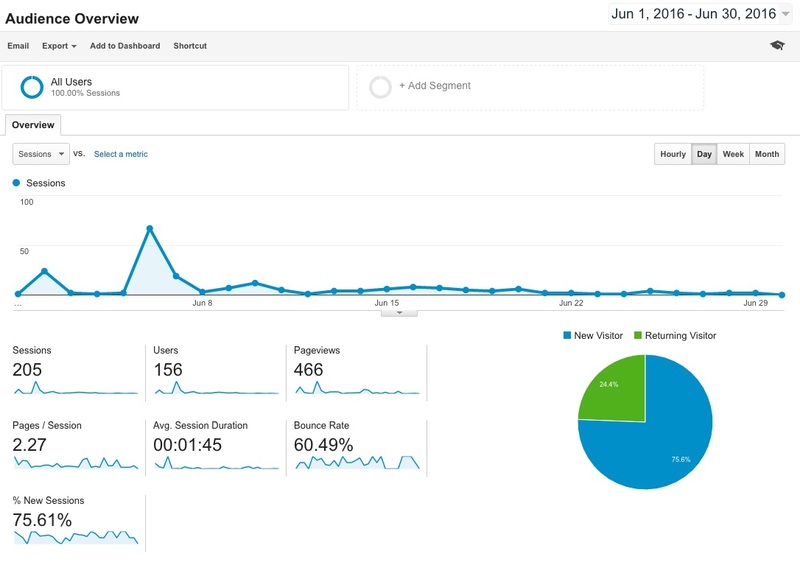 The site averaged about 6 visitors a day. What I like to see is that the pages per session, session duration, and bounce rate are all good numbers. This lets me know that the design of the site is working and that people are sticking around to read the content. It can be too easy to believe that just because you bought a theme, that it works in keeping people around on the site. The numbers themselves aren’t big or gaudy, but I’m excited about them. They let me know I have a nice foundation for the site and I can focus on getting traffic from here on out. Just to reiterate, nothing crazy was done in trying to get traffic. I posted to my Twitter account and did a lot of posts on Pinterest. Besides that, nothing else was tried and this was on purpose. Looking at the traffic graph you can see the final day of June had a nice little spike of traffic. This came from a tweet by Summer Tannhauser. I wrote an epic 3,000+ word review of Tailwind and BoardBooster and decided to reach out to her to let her know about it. I didn’t randomly select her. I chose her because she specializes in Pinterest and her audience is all about learning how to make Pinterest work for their business. My epic post is right up her audience’s alley and provides them with serious value so it benefits her sharing it to them. Don’t just blindly reach out to bloggers asking them to share your posts. Make sure it is relevant to their audience. Thrive/Strive showed similar numbers to Obstacle.co, but a completely different trend. Most of the traffic was accumulated on two different days at the beginning of the month. This looks pretty crappy, but let me explain. Because I’m working on this site with my wife and brother, a majority of the month was spent on learning a good process for writing and promoting content. The goal for the month wasn’t to make Thrive/Strive huge. The goal was to make sure that they found a process that works for them so that moving forward everything is easier. I do want to get the average session duration up and the bounce rate down, so this month I’ll be working on some design tweaks to make those things happen. It is important that you track your growth metrics, but that you don’t get caught up in those metrics. Melyssa Griffin wrote a great post about metrics and I agree with her approach. She also shares an awesome Google Spreadsheet that you can use to keep track of different metrics. I’ll be using it here. Again, nothing crazy with these numbers. I spent over 95% of my time on Pinterest trying to better understand the platform and things are definitely on the upswing there. In July I’ll put a little more emphasis on Twitter, but not much. Be careful in trying to spend time on every social network. Pick one and run with it until you master it. If you aren’t sure which one then don’t worry about any of them and try to build connections for you blog in other ways. Eventually you’ll understand where your audience hangs out the most. Low numbers, but again it’s because a lot of the experimentation occurred on the Obstacle.co side of things. This month I expect the numbers for Instagram, Pinterest, and the Email List to go up a healthy amount. For the month of June, the only goal I set for the sites was to get them out the door. I accomplished that goal, but now it’s time to set some concrete goals that I can actually try to reach. You’ll notice there are a couple of growth metrics that I left off. For example, I’m not overly concerned with growing my Twitter audience although I will put a little more effort into doing so. I’m also not looking for a specific amount of visitors, but instead want to focus on page views. That means getting people to look at more pages instead of just random people showing up and leaving. The most important goals are email list subscriptions and revenue. As you can see I’ve set the lofty goal of reaching $5,000 in revenue for July. This is far from the $0 I made last month and my list is only at 42 subscribers. In a perfect world, that would mean all 42 people pay $120 for a product. I don’t see that happening so I’ll really have to hustle to pull this off. It will be exciting to see if I can get there and I think I can. The goals for Thrive/Strive are a little bit lower than those for Obstacle.co and the reason why is because most of my time is currently devoted to Obstacle.co. Although I have my wife and brother helping me with Thrive/Strive I don’t want to put any pressure on them to perform to certain goals that I’ve set. If all goes well we will have achieved $7,000 from our two new blogs. How awesome would that be for you to generate a couple thousand dollars from your blog in just the second month? Pretty damn awesome. This marks the halfway point for 2016. Are you where you thought you would be when you made your New Years resolutions? If not, time to get started now. As you can see, you’ll start off slow, but with some planning and consistency you’ll end up with a strong business that you love. You don’t get what you don’t ask for so I’m asking you to take a second to share How I Lost Money My First Month of Blogging with your audience. They respect great content.